Forbes – April 22, 2019 President Emily Bancroft shares her path to CEO and three ways for women to begin their journey to their own leadership positions. Read the article. Cyclone Idai Update – March 31, 2019 Vice President Patrick Sikana provides an update on relief efforts and VillageReach’s response. Read the update. Press Release – March 30, 2019 VillageReach and MaiKhanda Trust announced that MaiKhanda will assume responsibility for the Kwitanda Community Health Project (KCHP) in the Balaka district of Malawi. Read the press release. Cyclone Idai Relief Support – March 22, 2019 President Emily Bancroft provides an overview of relief efforts in the wake of Cyclone Idai, and ways to support. Read the update. CASE in Point Podcast – March 6, 2019 President Emily Bancroft shares her personal journey, the history of VillageReach and lessons on government partnerships learned along the way. Listen to the podcast here. Crosscut – February 1, 2019 In light of Washington’s measles epidemic, President Emily Bancroft shares four ways Washington can learn from Africa’s vaccination programs. Read the article here. Elsevier: Vaccine Journal – December 19, 2018 Ruth Bechtel, Mozambique country director, and colleagues examine how microneedle patch (MNP) technology may provide additional benefits beyond the point-of-use, particularly for vaccine supply chains. Read the article here. The British Medical Journal – December 7, 2018 Carla Blauvelt, country director, and colleagues describe a multisectoral collaboration that enabled the scale up of Chipatala cha pa Foni (CCPF) – Health Center by Phone – service and its transition to government in Malawi. Read the article. Announcement – October 17, 2018 Patrick Sikana named as vice president of VillageReach. Read the announcement. Announcement – October 17, 2018 Craig Usswald hired as director, supply chain. Read the announcement. Stanford Social Innovation Review – September 27, 2018 This story was written by Emily Bancroft and highlights six lessons in sustainable impact for NGO leaders based on the VillageReach work in DRC. Read the story. Scaling Pathways – September 26, 2018 VillageReach featured in Scaling Pathways, “Leveraging Government Partnerships for Scaled Impact.” Read the paper. VOA Africa – August 2, 2018 Highlights the positive impact CCPF has in increased care for maternal health in Malawi. Watch the story. Press Release – July 15, 2018 WGHA announces VillageReach and Planned Parenthood of the Great Northwest and Hawaiian Islands as winners of the 2018 Pioneers of Global Health Awards for Outstanding Collaboration. Read the press release. CGTN Africa – July 13, 2018 Highlights CCPF and its role in improving access to health information in Malawi. Watch the story. Seattle Met – May 22, 2018 VillageReach Goes the Last Mile. Read the story. Announcement – May 22, 2018 USAID awards VillageReach $14.7 million for Last Mile Supply Chain Project. Read the announcement. The Financial Post – April 20, 2018 Insights from the Skoll World Forum, VillageReach’s Alinafe Kasiya highlighted. Read the article. Press Release – April 14, 2018 The Malawi Ministry of Health notifies the public of humanitarian drone flights beginning on April 18, 2018. Read the press release. Skoll Perspectives – March 26, 2018 From Theirs to Ours: Proximity and the Power of Relationship by Alinafe Kasiya, Malawi Country Director. Read the blog. Press Release – February 2, 2018 The Malawi Ministry of Health Announces Nationwide Expansion of CCPF. Read the press release. The Skoll Foundation- January 2018 Sustainable Health Solutions for the Last Mile: VillageReach Builds Them and Lets Them Go. Read the story. Announcement- December 6, 2017 Emily Bancroft Named President of VillageReach. Read the announcement. Madison Park Living Magazine – November 2017– VillageReach profiled for “Making a Difference” feature. Read the article. Press Release- November 2, 2017 VillageReach selected as a recipient of Bull City Learning Next Generation Immunization Training Grants. Read the press release. People that Deliver – September 2017 Combatting pharmacy personnel shortages in Malawi. Read the article. Announcement- August 24, 2017 VillageReach announces President transition. Read the announcement. The Fullest- July 25, 2017 VILLAGEREACH: SERVICING AFRICA’S LAST MILE Read the article. The Guardian – April 28, 2014 Melinda Gates on the Nine Players Changing the Vaccine Game Melinda Gates acknowledged Margarida and VillageReach as a top global vaccine innovator. Read the article. Huffington Post – April 2014 Start at the Last Mile to Overcome barriers to healthcare delivery. Read the Blog by Allen Wilcox. 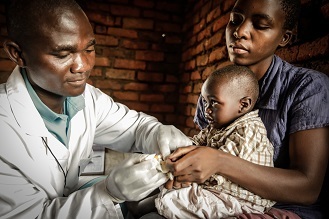 GSMA Blog – February 2014 A Symbol of mHealth in Malawi: Her Name is Promise Read the post. Mashable – January 2014 Tiny Call Center Provides Health Services to 200,000 People Read the article. Voice of America – January 2014 Malawi Uses Mobile Phones to Promote Maternal Health Read the article. Wired UK – December 2013 Bill Gates named Margarida Matsinhe from VillageReach as “one emerging talent whose ideas or influence will soon be part of our lives. Read the article. South Africa’s National Health Insurance (NHI) Will Benefit the Entire Region – August 30, 2013 Trevor Mundel, President of Global Health at the Bill & Melinda Gates Foundation, discusses VillageReach, Africa & healthcare access. Read the article. GAVI Newsletter: The Civil Society Dose – December 2012 Case Study: Illuminating the last mile Read the article. GAVI Newsletter: The Civil Society Dose – May 2012 Case Study: Improving Vaccine Logistics in Mozambique Read the article. National Bureau of Asian Research – November 2011 Matching Realism with Aspiration – NBR Interviews Emily Bancroft on key considerations for applying technology to Global Health. Read the article. Puget Sound Business Journal – October 28, 2011 Nonprofits Debate Merits of Admitting Failure – VillageReach is featured in this story on the benefits of transparency and reporting on mistakes. Read the article. Puget Sound Business Journal – April 22, 2010 Nonprofit revenue model evolves – In the current edition of the Puget Sound Business Journal, subscribers can read my story on Seattle-based VillageReach and the nonprofit’s new information management system that is aimed at helping global health groups better manage supply chains for health clinics. Read the article. Puget Sound Business Journal – April 16, 2010 VillageReach nonprofit rolls out supply-chain management system – Despite recent gains in global health research and development, a local nonprofit says health care systems still face a significant bottleneck in how they deliver services and commodities to the world’s poor. Read the article. University of Washington Newsletter – A&S Perspectives, December 2009 Ensuring That Health Care Reaches “The Last Mile” – Craig Nakagawa (‘89), armed with an MBA and experience at Lehman Brothers and Teledesic, co-founded VillageReach, an NGO aimed at improving health care distribution systems in the most distant reaches of developing countries, beginning with Mozambique. Read the article. University of Washington – Columns, November 2, 2009 Working Globally – As a cofounder of Seattle-based VillageReach, Craig Nakagawa values the UW as a resource for partnering on research and reaching talented students. Read the article. Seattle Times, September 2, 2009 Fremont nonprofit delivers vaccines and energy to world’s remote areas – VillageReach, a tiny nonprofit in Fremont, blends technology and entrepreneurship to deliver vaccines and energy to some of the least-developed areas in the world. Read the article. The Chronicle of Philanthropy, September 1, 2009 Social Business Wins Big Investment – VillageReach, a nonprofit organization in Seattle, took a novel approach to trying to improve the health of people living in remote areas of Northern Mozambique. It started a propane-distribution company. Read the article. Seattle Times, September 1, 2009 VillageReach fuels change in global health delivery – VillageReach has figured how to get health care into the heart of remote communities that others haven’t managed to reach — the so-called “last mile” — and pay for it with a for-profit energy business. Read the article. Chicago Booth Magazine, September 28, 2007 2007 Distinguished Alumni Awards: Craig Nakagawa, ’97 – Craig Nakagawa, ’97, left Wall Street to travel coach to Africa to get money from Bill Gates to bring vaccines to Mozambique. Read the Article. Newsweek, July 25, 2005 Blaise Judja-Sato– A Wharton M.B.A. Brings Basic Health Care to the Poor of Rural Mozambique. Read the article. Forbes, September 6, 2004 The Last Mile – Blaise Judja-Sato had a nice job selling telecom services–until he saw what the lack of vaccines was doing to the poor in Mozambique. Read the article. The Seattle Post Intelligencer, April 13, 2004 Propane powers vaccine program – Former telecom executive hits upon unlikely business pairing to improve African children’s health care. Read the article.